Strong and Durable - This mat is made with the highest quality materials. Non-Slip – We’ve got your back with the non-slip backing that works on all floor types. From hardwood, to tile, to wood or ceramic this mat will stay securely in place, leaving no marks. Safe Materials – We want to keep everyone safe and happy. That why we have used Eco friendly, safe non-toxic materials to create the ultra-durable and absorbent doormat. Ultra-Absorbent – The Super absorbent fibers are made from 45% natural cotton and 55% microfiber. Simply step onto the mat and your footprints remain on the mat, no more telltale muddy footprints around the house. ours measures 36" X 24" inches, covering ample area in your entryway. simply throw it in the washing machine and it will come out as good as new. Multiuse – You can use this mat in a bathroom, kitchen, office, store, salon, garage, house or apartment. It absorbs any moisture or wetness from people’s shoes or pets paws. SUPER ABSORBENT FIBERS: - Absorbs anything like magic! not need to wipe your feet, just clean to step. Scrap off dirt, water, dust, grit, mud, slush, sleet, grass or rain, snow and absorbent moisture from shoes instantly, keeping floors clean and dry. INDOOR MAT: - Measures 24" x 36". Dark gray-ish is make up of black and white fibers. 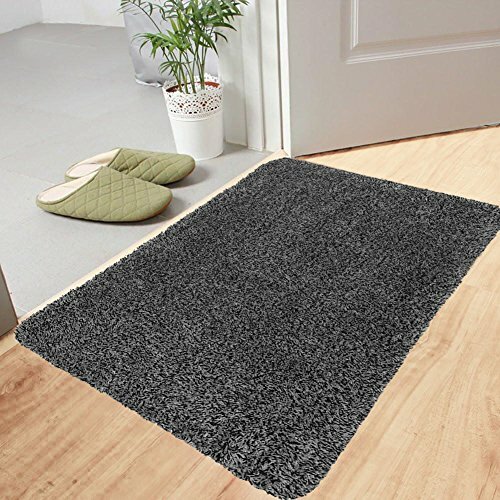 Heavy duty entrance rug carpet widely used for home decor, indoor front welcome mat and kitchen rug, floor mat, bedroom, back door, laundry, living room, garage, office, industrial, commercial deal with high traffic inside. Please note it is not suitable for the bathroom and don't place it in a wet or watery place. NON-SLIP& LOW PROFILE: - Non-slip latex backing won't slip or scuff floors. Low profile design so doors won't get stuck. Perfect for homes with pets or kids. EASY CLEAN: - Washable just machine shake or hose off with water. Please note mashine wash in cold water without detergent or fabric softener, some shedding of fibers will occur in first washes.